I remember the first time I tasted really good authentic carnitas. I was at La Sandia, a Mexican restaurant owned by one of my favorite Mexican chefs, Richard Sandoval. I order the skillet pork carnitas from the menu. They were unbelievably good. There was a sweetness to the pork that really put them on another level from any carnitas I’d had before. A few months later I was lucky enough to meet Chef Sandoval at a book signing at the restaurant. I couldn’t help but ask him what the secret was. You know what he said? Coke. That’s right, original cane sugar Coke. I began experimenting with my own authentic carnitas recipe after that. I knew that good carnitas needed fat. To be truly authentic, they should be slow cooked in lard. However, I’ve come up with a solution to avoid this. They also need citrus/acid and a sweet element. Oranges and coke. This is really all you need to create the most authentic tasting, crispy and delicious pork carnitas you’ve ever tasted. It works every time. And there’s very little preparation involved. 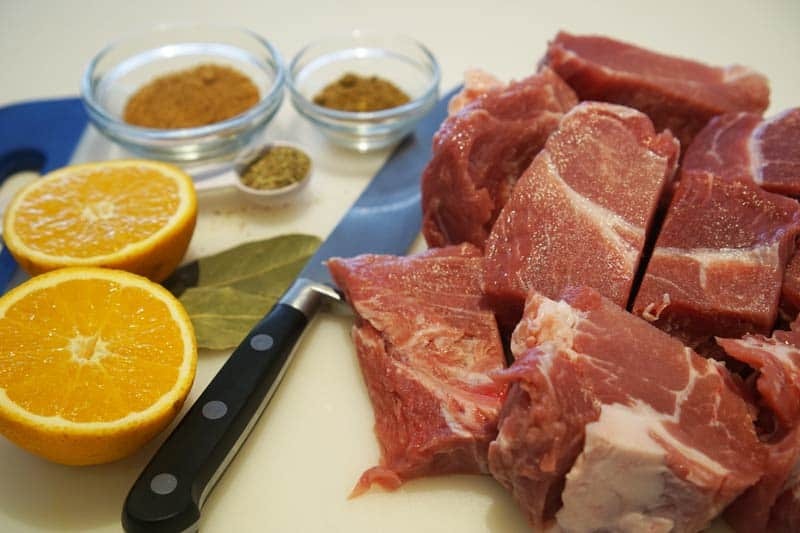 I prefer to work with boneless pork shoulder and I cut it into large chunks. You can also use bone-in pork shoulder and leave it whole, if you wish. The way I get around using full lard to braise the meat is to add in as much of the fat as is possible. Buying a fatty piece of shoulder is the best way to do it. Brown and cook the fat with the rest of the meat to create juicy and unctuous carnitas. The first step is to salt the pork and brown it in a stock pot on all sides. This takes about 6 minutes. Once it’s browned, add the rest of the ingredients to the stock pot. This includes the orange juice, spices, can of Coke and water. Note: You can use a stock pot on the stove to cook your carnitas. You can also use a slow cooker or a pressure cooker, like the Instant Pot (which I adore). The cooking time will vary for all three methods. If cooking on the stove top, set the heat to medium low, so the liquid in the pot is just bubbling, but not boiling. Cover with the lid. Maintain this level of heat for around 3-4 hours. If you’re using a slow cooker, set the cooker to low and leave it for the day. It will need to cook for at least 4-6 hours. The pressure cooker will take considerably less time. In the Instant Pot, set it for 45 minutes on the “Meat” setting. After the cook time is up, you will have a pot of meat that looks like this, and smells incredible. I chose to keep the meat in as large of pieces as possible until I decide how I’m going to use it. Of course, it comes out fall apart tender, and perfect for carnitas tacos, burritos, or tortas. Really there is no limit to how you use the carnitas pork. You can even just serve it by itself. It’s THAT good. 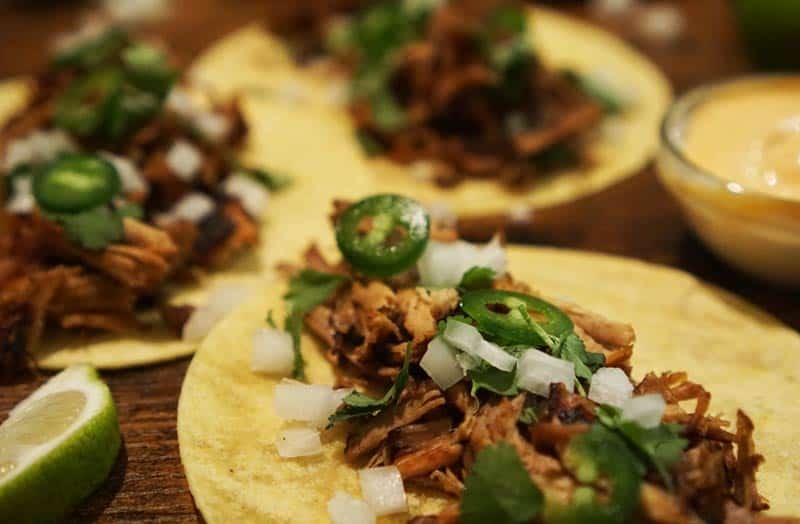 For carnitas tacos, I shred the meat up into small, bite-sized pieces, then crisp it up either on a pan on the stove, or on a baking sheet under the broiler. For just a couple of servings, the pan works just fine. Add a little oil and heat on high. Then add the meat and allow it to brown without moving it for around 30 seconds per side. When the meat is crisped up, you can pile it onto warmed corn tortillas, followed by diced onion, cilantro and a spritz of lime. That’s all you need to make the perfect authentic carnitas tacos. Adding the Coke might seem like a strange addition, but believe me – it’s really integral to the outcome. The acid and sugar really give it a boost. Be sure to use the real cane sugar Mexican Coke, if you can find it. Do not use Coke Zero or Diet Coke as a substitute. If you don’t want to use Coke, or don’t have any on hand, you can replace it with extra water and 2 tbsp cane sugar or light brown sugar. 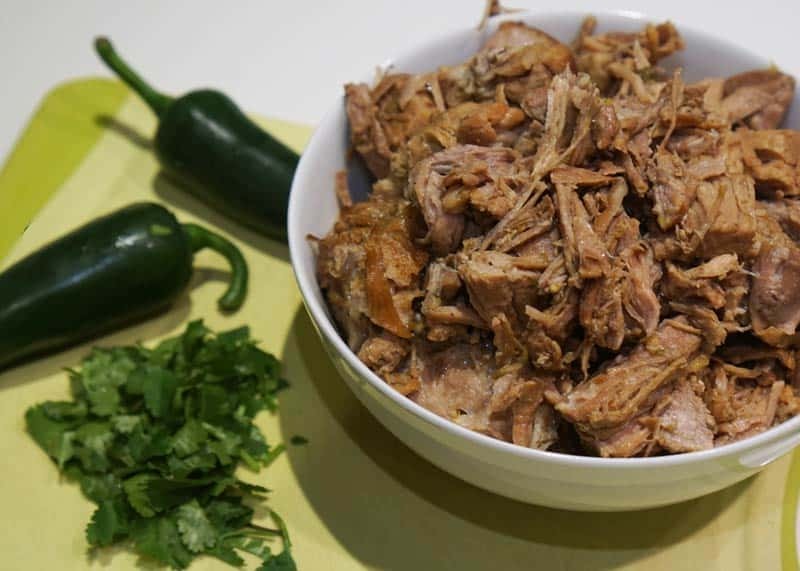 Have you made carnitas before? How does your recipe differ from ours? Tell us what you love about them in the comments. This authentic carnitas recipe can be used to make many different dishes, including these crispy pork carnitas tacos. Rinse pork and pat dry with a paper towel. Salt and pepper the pork. Cut into large chunks. In a 6-quart stock pot over medium-high heat, add 1 tbsp olive oil. When hot, add pork pieces and brown on all sides, about 3 minutes per side. Add the cumin, oregano, garlic cloves, orange juice, Coke and bay leaves to the pot. 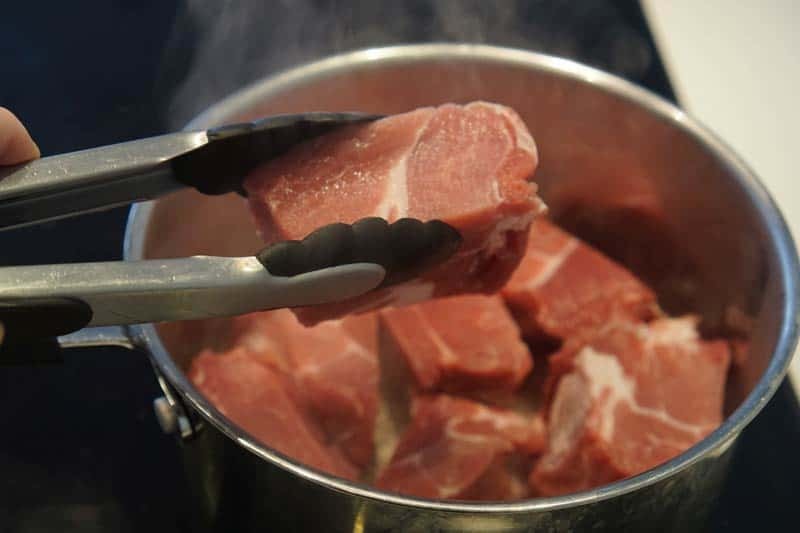 Cover and maintain a low boil over low heat for 3-4 hours, until the meat is tender (it falls apart when forked). Alternative: If cooking in a slow cooker, cover and cook on low heat 5-6 hours. In the pressure cooker, cook for 45 minutes on high pressure. Remove pork from the braising liquid. Heat ½ tbsp olive oil in a skillet over high heat. Add the shredded meat to the pan. Allow it to brown for at least 30 seconds untouched. Flip the meat over and brown an additional 30 seconds. Remove from heat. Warm 6 corn tortillas according to the package. Place an ample amount of carnitas in the center of each tortilla. Sprinkle each taco with onions, cilantro, and jalapeno slices, to taste.